Dating from the 12th century, Bayon Temple is the spectacular central temple of the ancient city of Angkor Thom. The complex is located just to the north of the famous Angkor Wat. 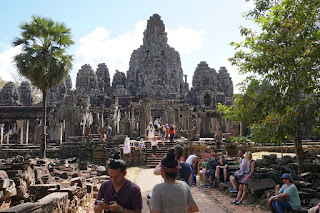 History of Bayon Temple: Built around 1190 AD by King Jayavarman VII, Bayon is a Buddhist temple but it incorporates elements of Hindu cosmology.